A week back, OnePlus launched its flagship phone that rocked a super awesome Snapdragon 820 processor, a great camera, and battery life. Sound familiar? Of course, it would. Samsung Galaxy S7, this year’s premium flagship phone from Samsung comes with the same chip and similar specifications. 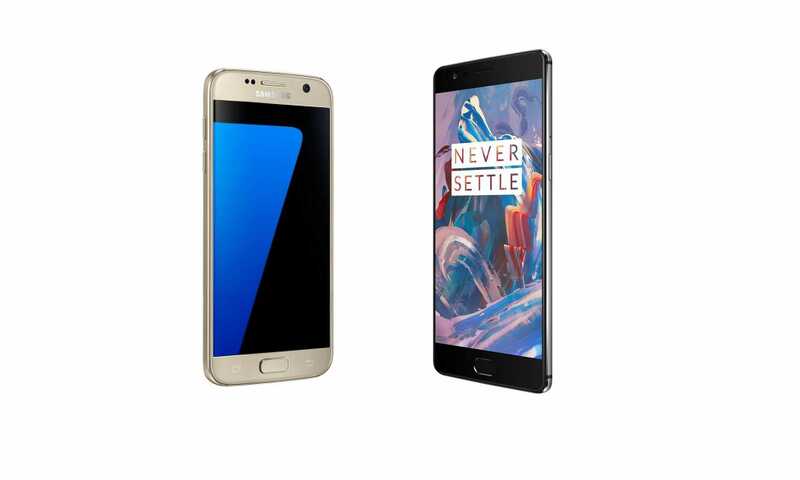 Now, the battle of flagships will begin, Let us find out which flagship wins in OnePlus 3 Vs Samsung Galaxy S7 battle. In this feature to feature comparison, we aim to see if the extra 20,000 you pay to buy a premium flagship with similar specs as a budget flagship is really worth your while. 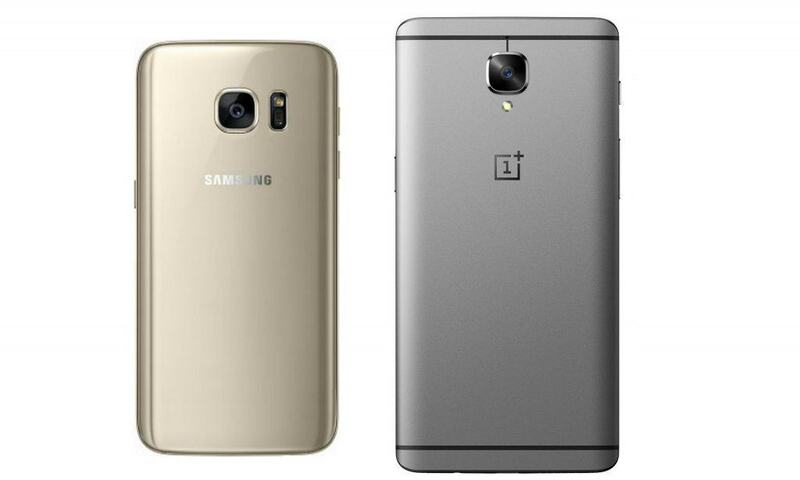 The first segment in the OnePlus 3 Vs Samsung Galaxy S7 battle is the design aspect. 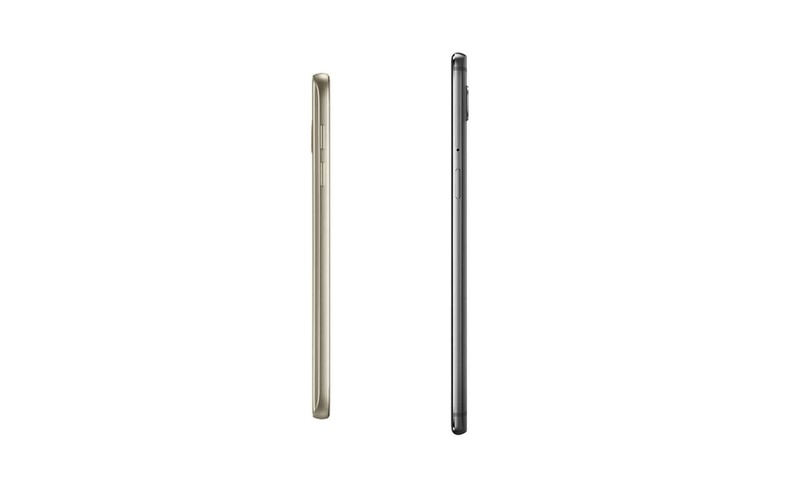 Both the flagships look sleek & solid and come with Gorilla 4 protection. OnePlus 3 comes with an anodized sturdy metal body with dimensions of mere 153757mm, thinner than the Galaxy S7 at 142708mm. The S7 weighs about 6g lesser than OnePlus 3 but you would hardly notice the difference. From the front, features are pretty much the same with a fingerprint scanner (super-fast in both cases) and capacitive buttons (which you can turn off in OnePlus 3). Bezels are thin (less than a mm) in OnePlus 3. S7 comes with IP68 and is completely dust and water-resistant. On the rear end, though, there is a huge camera bump in OnePlus 3 owing to the bigger camera module. S7 nails it here with an almost non-noticeable bump and a clean finish. Though both phones feel premium in hand, you’d pick the S7 if you are into the glassy finish and the sturdy metal lovers would stick to OnePlus 3. Is it worth the extra money you pay for S7? 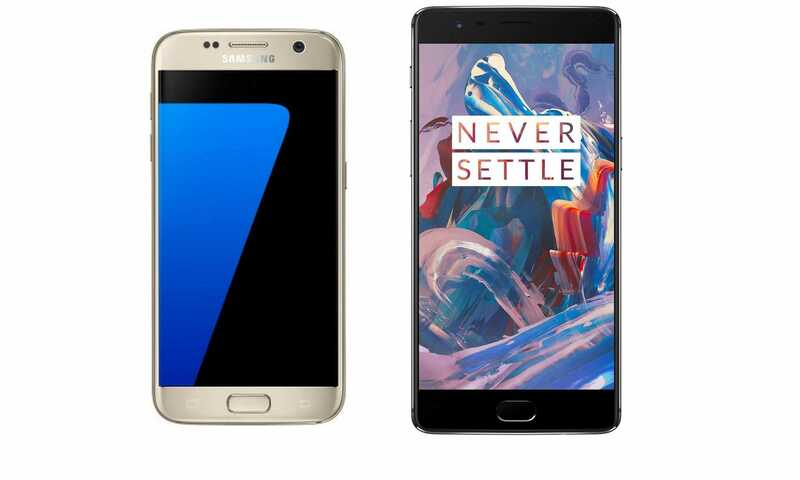 The S7 comes with a 5.1-inch QHD AMOLED display whereas the OnePlus 3 comes with a 5.5 inch Full HD AMOLED display. Full credits to both phones to have featured OLED displays which would let the devices become power-efficient. Although the QHD looks cool on paper, technically a human eye is not going to be able to differentiate between a QHD and a 1080p display. Unless it is a VR phone, it is highly unlikely that you might find this as a significant difference. The OnePlus 3 still throws up sharp, bright screens at 1080p. So, is it worth the jump? Both the phones are rocking a Snapdragon 820 chipset – the most powerful chipset seen on smartphones today. While S7 uses an Adreno 430, OnePlus 3 sports a 530 GPU. The biggest selling point, however, has been the whopping 6 GB of RAM that OnePlus has packed into this beast. While OnePlus 3 has an internal 64 GB storage with no expandable storage, Samsung S7 has a 32 GB inbuilt storage with an expandable storage of 200 GB. Unless you are into hard-core gaming, both smartphones make every day multitasking a breeze. Both the flagships have a 3000mAh battery with a fast-charging feature. While OnePlus 3 has got a downgrade from OnePlus 2 in terms of battery capacity, it is a huge upgrade for S7 from S6. S7 also comes with wireless charging feature which is not there in OnePlus 3, blame the metal body. DashCharge helps OnePlus charge for a day’s usage in about 15 minutes and hence it shouldn’t be a factor to worry about when you compare both phones. Here’s where there is a marked difference in both phones – With S7 sporting a 12 MP camera, OnePlus sports a 16 MP rear-facing camera. While the 12 MP number looks modest on paper, S7 has one of the best smartphone cameras available in the market with its F/1.7 aperture. While OnePlus 3 also scores quite well with the 16MP camera, F/2.0 aperture does justice to the price you pay with PDAF, EIS, and OIS. Unless you want 4K videos shot with best in class autofocus in videos with faster aperture and camera, the difference is not much. OnePlus 3 picks up finer details in daylight; the low-light pictures are quite good too. 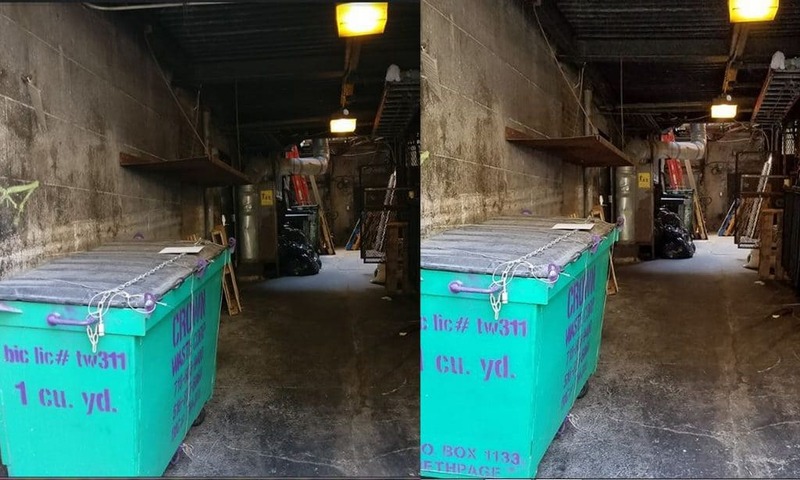 Samsung S7 pictures look a little over-exposed which is a common feature in all smartphone cameras. With the front camera in S7 also having a F/1.7 and auto focus, it helps you to get the best selfies. OnePlus 3 has a 8 MP front camera which performs equally well in similar light settings. So, if you are using your phone for professional phone photography and you’re looking for high-quality videos, S7 is definitely worth the extra money you paid. The fingerprint sensors and the camera shutter speed are equally fast in both the phones. Apart from the unnoticeable difference in Quad HD-Full HD display and a superior aperture in the camera, there isn’t much that OnePlus doesn’t offer. In fact, it betters S7 with its RAM and performance. If OnePlus had sacrificed the thickness for extra battery power, it would have taken Samsung hands down. And this makes an end to the OnePlus 3 Vs Samsung Galaxy S7 – battle of premium flagships, let’s see what’s our verdict is. On the whole, if you are the one to whom the brand really matters a lot, you should stick to S7. But OnePlus’ forte is to spoil you with flagship specs at a fraction of the cost and it has raised its game this time around. So, it’s down to your preference to have a brand in your mind or a heavier wallet.